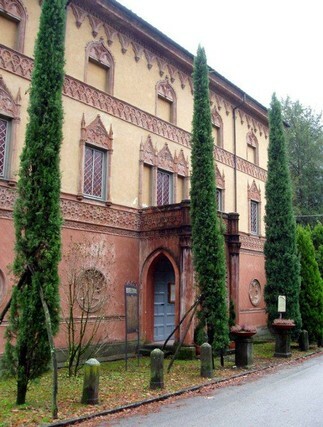 The building was built in 1840, authorised by Carlo Lodovico di Borbone, Duke of Lucca, on the initiative of Henry and Elizabeth Stisted, an English couple who had settled in Bagni di Lucca and had fallen in love with the place so much that they wanted many other fellow-countrymen to come there and a place for the Anglican cult. The neo-Gothic Anglican church has the shape of a palace as Carlo Lodovico didn't want it to look like a real church not to clash with the Roman Church. It was designed and built by the architect G. Pardini. Since 1976 it belongs to the Comune and is used as the seat of the "Adolfo Betti" Public Library. An important collection of books is preserved also in the library donated to the City Council by the English Professor Jean Greenlees, who chose Bagni di Lucca as his residence. In 1842 the Stisteds also opened the Cimitero Anglicano, which is located on the other bank of the river along the Statale del Brennero.